We love to play miniature golf and the Harrisburg and Hershey area in Pennsylvania has several great mini golf courses for you to enjoy. All of these mini golf courses are affordable, fun and family-friendly. They are all located in a great location and near places where you can grab something to eat. Some of them offer additional fun things to do like batting cages, arcade games, go karts and more. 1. Bumble Bee Hollow - This is a great mini golf course for those who don't want to travel down into the city. You can find casual dining, sub shops & ice cream shops within walking distance of this fun golf course. They are located at 4201 Linglestown Road in Harrisburg. 2. Water Golf on City Island - This mini golf course is located on the famous city island in downtown Harrisburg. You can find it at 600 Riverside Drive, in Harrisburg, PA. This is a beautifully laid out course with water hazards, water falls, etc. It's one of our favorites here in the area. 3. The Meadows Mini Golf - This 18 hole miniature golf course is new the Harrisburg area and is managed by The Meadows Frozen Custard Shop. In addition to mini golf and frozen custard, they also offer batting cages for those who enjoy that. 4. 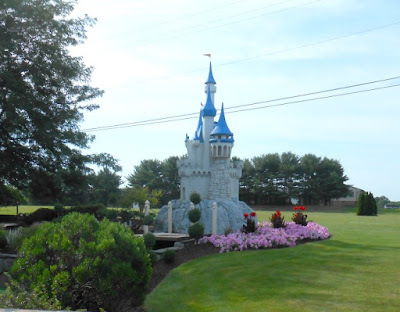 Challenge Family Fun Center - We love taking the kids and visiting this one which is located in Hummlestown, right outside of Hershey PA. You can find them at 366 Middletown Road in Hummelstown. They have a beautifully laid out course, arcade for the kids, indoor mini bowling, skee ball and batting cages. A lot of affordable family fun to be had here! 5. 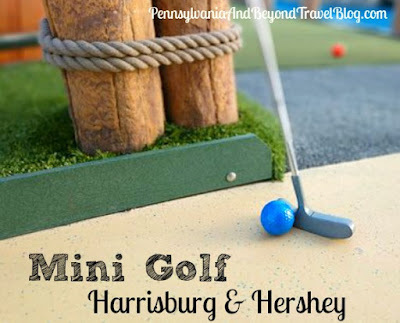 Adventure Sports Mini Golf - This miniature golf course is located in Hershey Pennsylvania and is really easy to get to. In addition to mini golf, they have on-site go karts, laser tag, bumper boats, batting cages, an arcade, golf driving range, ice cream parlor and more! They are located right outside of downtown Hershey and within a 15-20 minute drive from downtown Harrisburg. When visiting the Harrisburg and Hershey area in Pennsylvania, there are a lot of fun things to see and do. The next time you are visiting the area, make sure you stop in and play some mini golf or have some fun in the batting cages! If you live in this area...plan an afternoon out for the family to take in some golf, ice cream and have some fun!